Later, when she would fire her management and devote herself to daily Bible study, she would be vilified as crazy, by many close to her, including the other members of the group that made her famous, The Fugees, who declared she needed psychiatric help. After just one subsequent album of her music – an MTV Unplugged performance that was widely panned for its difficult-to-follow rambling – Lauryn Hill appeared to disappear from public life, and from music in general. Although she did reunite briefly with the Fugees in 2004, her status as hip-hop queen of neo-soul would never return. But her legacy was sealed. As the first woman ever to be nominated for 10 Grammy Awards in one year, and with an album that spoke to – and for – a generation, Ms. Hill didn’t really need to produce more music to cement her place in hip-hop history. She focused instead on raising her six children, including five with Bob Marley’s son Rohan. After occasional sightings and a few isolated performances, as well as a three-month stint in prison over tax evasion, Lauryn Hill has chosen to all but fade from view. But not her iconic album. 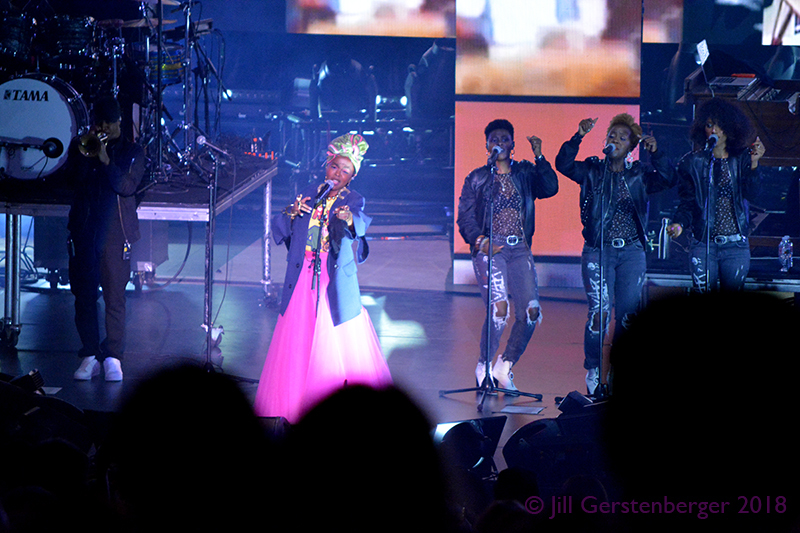 The 20th Anniversary of The Miseducation of Lauryn Hill tour made a stop in the Bay Area at the Shoreline Amphitheater. 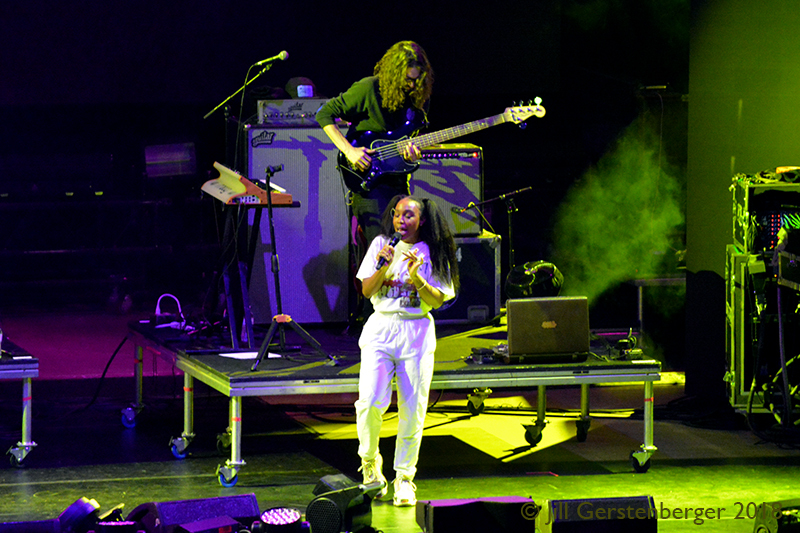 Opening acts included DJ Reborn, Shabazz Palaces, De La Soul, and newcomer SZA. Despite starting her set fifty minutes late, leaving anxious audience members to wonder if she was going to show up at all, in actuality, Ms. Hill’s set was perfectly orchestrated to end at 11PM on the dot. 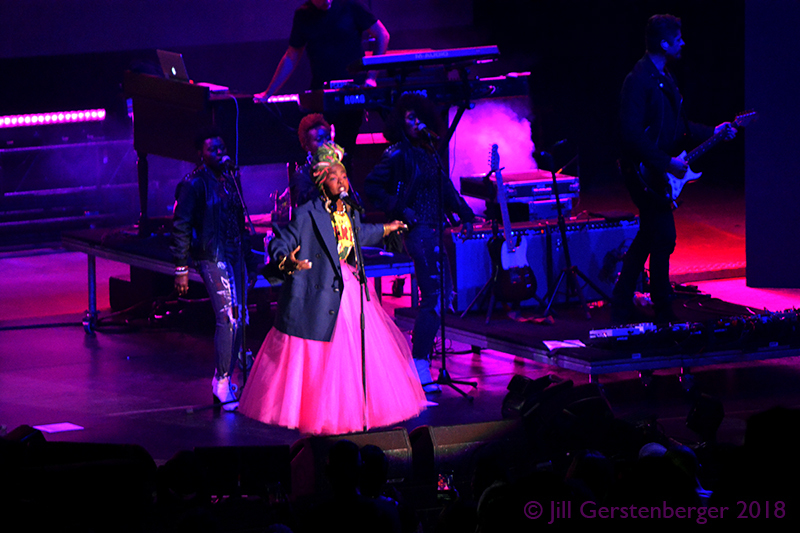 Backed by a band of ten, including a DJ, trumpet player, and three backup singers, Ms. Hill graced the stage wearing a hot-pink tutu skirt reminiscent of a 60s prom dress, with a shiny blue blazer open around her waist. 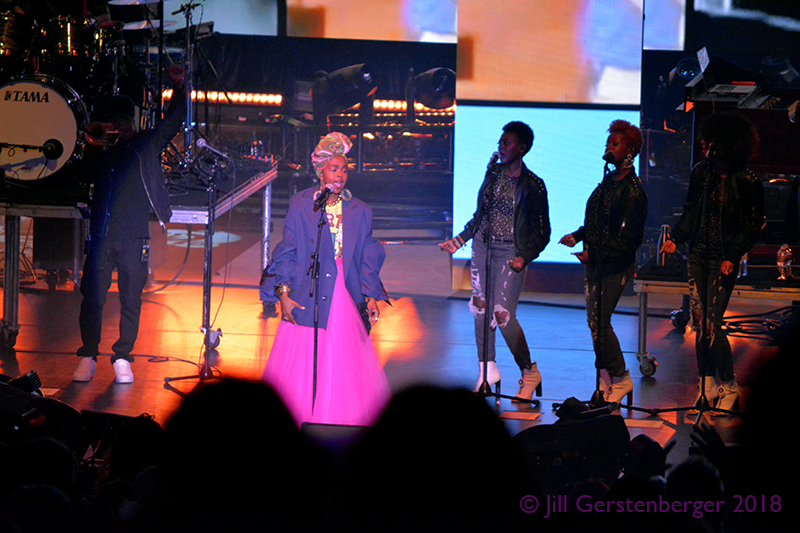 Her hair, like that of her backup singers, was in an updo wrapped in kente cloth, lending a regal air to her presence. Her critics may not have been kind to her as of late, but time certainly has: despite being a grandmother now, she looked every bit as youthful and impossibly cute as when she first took hip-hop by storm while still in high school in the mid-90s. There were no surprises in the set list; although she played every song on the album, she didn’t play them in the album’s order, taking the audience instead on a social commentary-filled musical journey that she helmed. She opened with “Lost Ones” and followed up with “Everything is Everything.” Other highlights included “Ex-Factor,” “To Zion,” and “I Used to Love Him,” with “Final Hour” offering an interlude of social commentary about the need to usurp the system and change the world. “Look a this world,” she began. “Look at where we are, as opposed to where we could be; as opposed to where we should be. We need to make a commitment to leaving this world better than you got it; a commitment to educating and informing and caring for people; showing love to those who came before you, showing love to those who come after you. And, of course, in order to do all of this you have to show love to yourself. Self-care so that we can love others; self-responsibility so that we can be responsible toward others. She closed the show with her most popular song, “Doo Wop (That Thing),” and did not perform an encore. With her set being timed to end precisely at 11PM, it did feel a little like she wasn’t terribly excited to be there. 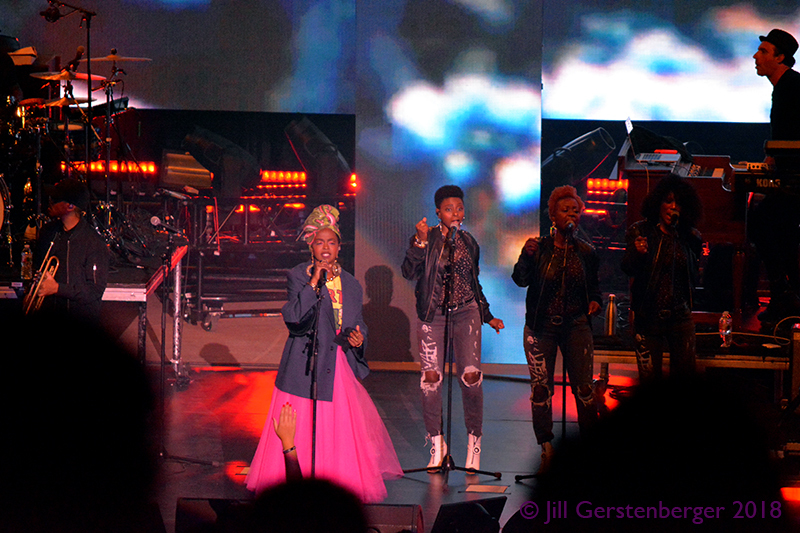 But considering that she hardly ever plays shows anymore, and certainly not the one album her fans all know and love, the audience seemed happy just to hear The Miseducation of Lauryn Hill live. She delivered what was promised. And since the show was billed as just that, no one really had the right to expect anything more. 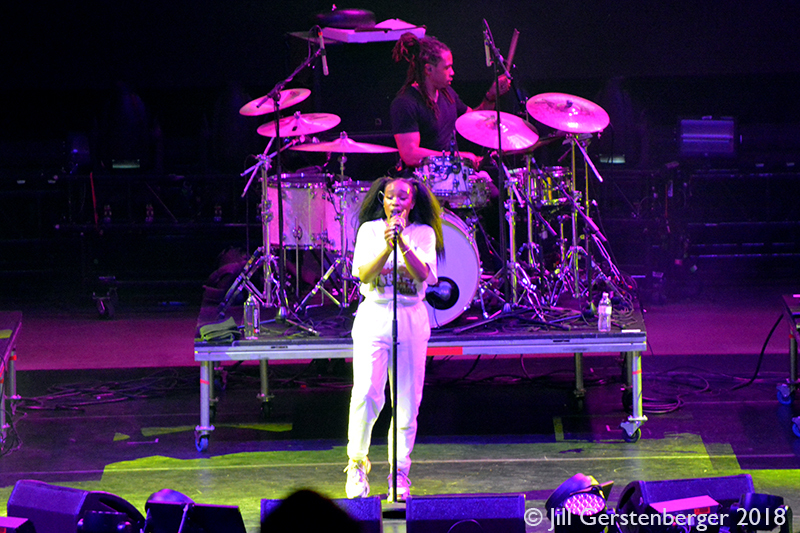 After all-male openers Shabazz Palaces and De La Soul, it was refreshing to see SZA take the stage just prior to Ms. Hill. The young songstress making waves for her soul-baring lyrics about loneliness, abandonment, not being good enough, and wishing she were a “normal girl” charmed the audience instantly with her down-to-earth stage presence and confident but self-effacing demeanor. With a sound that defies genres – she’s classified nebulously as “alt-R&B,” but her style is obviously more influenced by Bjork, Spike Lee, jazz and visual art, SZA sings revealing songs about being the other woman, enjoying getting stoned alone and never shaving her legs. She’s like a chanteuse, singing about romantic feelings she hopes to share someday with someone who’s not a prick. The crowd adored her, and her very existence seemed like a byproduct of the album the audience all came to see. 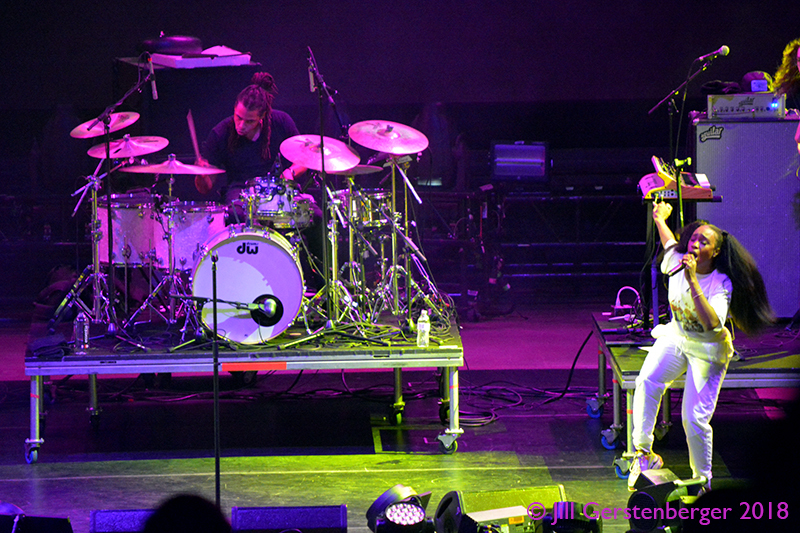 Dressed all in white in jeans, a T-shirt and basketball shoes, her between-song banter was disarmingly relatable. She wore no apparent make-up beyond darkened lashes and sang about wanting to be the kind of girl her Muslim father could be proud of. For anyone that didn’t already know her music, it’s pretty likely they became SZA fans that night. She was adorable, unpretentious and charmingly self-conscious, and the crowd was completely, and understandably, enamored. Find out more about Lauryn Hill here. Check out SZA on her Facebook page.